in Italy are a special tradition that is at heart of the winter festivities in many “piazzas” around the “Belpaese”. From big cities to small villages, the fever of the Christmas markets run through Italy for a couple of days or an entire month or even longer: some markets finish on the 6th of January (“Befana”). Christmas Markets in Italy are less numerous than the markets in Germany, but they are popular both with the locals and visitors from Europe and the UK. The Italians create every year also elaborate crib displays and nativity scenes close or as a centre for many Italian Christmas Markets. The Italian stallholders offer fantastic local food and drink plus locally manufactured seasonal gift products. Let’s have a round starting from the top Italian Christmas Markets in Northern Italy: for example let’s go in Trentino-Alto Adige Region: snow, mountains, great food and great Christmas markets, thanks to its influence coming from the close Germany. Many mountain towns hold Christmas markets: here you can find many lovely but pretty tacky items. But also some interesting wooden carved local handicrafts can be found here. Lights and sweeties complete the fun. 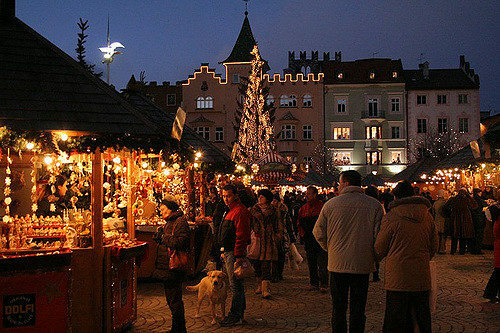 Trento holds one of the best Christmas markets in Piazza Fiera, from the end of November up to the end of December. The market shows off more than sixty traditional wooden huts which sell crafts, decorations, and food . A large Nativity Scene is created in Piazza Duomo, too. Bolzano holds a daily Christmas market from the end of November through December 23 in the historic center. Veneto has its share of markets on display as well: if you go to Campo Santo Stefano in Venice you will be surronded by the wooden houses in the piazza with the stalls selling high quality Venetian handicrafts. Verona in Piazza dei Signori has a huge German-style Christmas Market with wooden stalls from in late November through December 21. This entry was posted on Tuesday, December 11th, 2012 at 11:58 am	and is filed under Events in Italy. You can follow any responses to this entry through the RSS 2.0 feed. You can leave a response, or trackback from your own site.